The white dogwood in full bloom. It was the last of the new trees to fill out, while the red bud is getting its leaves now and so is the pink dogwood. So wonderful to see it first thing in the early morning pre-dawn. Behind it in one of the veggie beds is the Siberian Iris, planted with the now over daffodills and crocus. The last to bloom in this bed. One of our four fig trees has big new figs on the stem. So adorable. This is not the only one with little figs, but the others are really small. We have four varieties, so we shall see what happens with the rest of them. I found just the right table (Walmart.com) and chairs, (Amazon.com) and set them up yesterday, knowing we won't have rain for a few days. The patio was covered with tree buds, making a huge mess, not to mention the pollen which blankets the whole neighborhood. But then we had terrific winds and rain and all is cleared off, no sweeping required. Lots of wonderful perennials fill the beds, making planting much easier this year. Plus I added all those hydrangeas and hosta from other parts of the yard, making it a much less expensive planting season. I still have petunias and impatiens to get in, somewhere. Last season I believe I shook out some seed heads of zinnias/and or coneflowers over the beds and now I have lots of sprouts of things...I can always yank them out if they turn out not to be flowers. We'll see. Seedlings mixed among the hardy geranium transplants. Their second leaves have started appearing, so I may soon know what they might become. One of our four clematis is going crazy and I am still waiting for help getting the arbor in place. Sigh. Good help is hard to find. Here's another mystery. It looks to me like a daisy, maybe Shasta, but its in absolutely a different bed than where they were planted last year. It's quite vigorous, so I am willing to keep it, if it turns out to be a daisy, but where are the ones I actually planted last season? Never came up. Darn. On the other hand, here is a huge fennel colony which never actually died back over our mild winter. I shall be cutting out bulbs and grilling them soon, yum. If you should think I am a good gardener, um, here is proof that I am not. This poor hydrangea was planted in loose soil which washed away over the many rains we had, and now is bare root, but still struggles to live. I will transplant it into a better spot. Poor darling. Rain, glorious rain. Which means a good start for all the trees and plants that are in, so far. I had Nick's men bring the blue pots to the driveway to cover the unsightly cracked pavement and to finish off the river rocks lining the edge. Satisfied! In the pots I put marigolds, petunias, Rocket Snapdragons, Victoria blue salvia, and the existing coneflowers, hardy geraniums, rosemary and two different mints. They will be in the full sun, whenever it returns, but in the meantime they can busy themselves putting out roots. The pink dogwood is much pinker than I expected, really a light red. So pretty, just opening now. And we got our golden euonymus in late Thursday and Dave mulched the beds. I will be adding flowers in front when I find what I want. 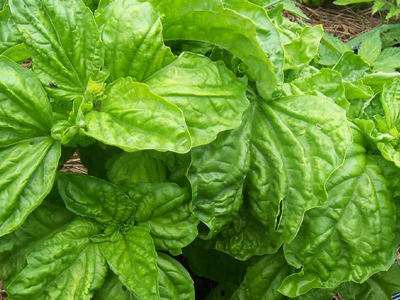 and lots of Lettuce Leaf basil. I have also had a minor victory with egg carton sowing of Lupins. 9 of them have sprouted and three have tiny secondary leaves. So happy! 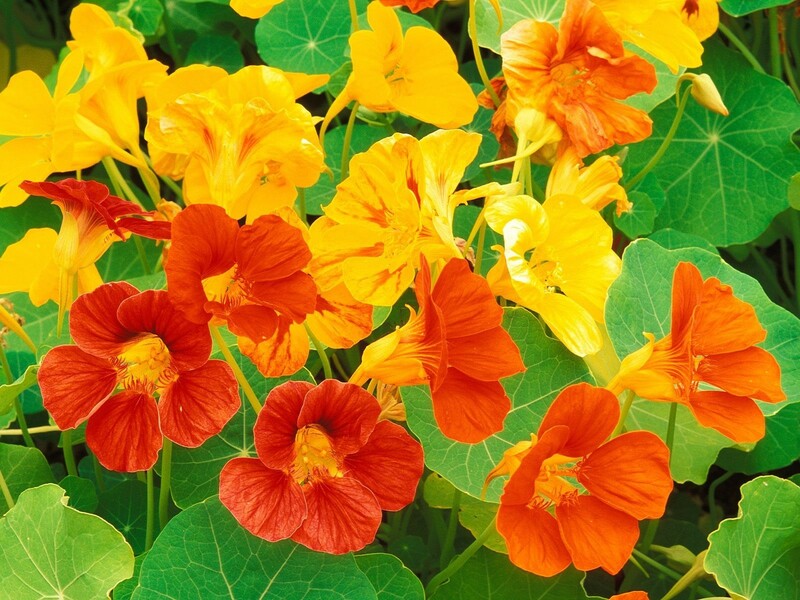 I also wet-started nasturtiums, and California Bluebells. This means putting a wet paper towel on a plate, sprinkling on the seeds and covering with plastic wrap. In a few days the seeds will show signs of life and I can then get them in the soil. I'll be direct sowing green beans and zinnias. I bought two tomato plants (determinate) which are already huge, Bush Goliath and Better Bush. Also Mammoth Jalapeno and some lemon thyme. I need more peppers, but am conscious of the cool weather, as they really like hot soil to do well. The really good news is that I did not kill my hydrangeas after all. 8 out of the 11 got transplanted to the patio bed and are leafing out merrily. Phew! I will take very good care of them from now on. O how excited I am today. I have new flowering trees and a half dozen arborvitae in the ground, thanks to my reluctant gardener Nick. I know in this light you can't see the flower buds, so I included close-ups. And notice the river rock edging along the driveway. This is to prevent the mud from getting all over when it rains. Mulch is coming to be a ground cover for all of this, again. I will be getting my blue pots to dress up this area, filled with bright annuals. More plants, YES! And the long view. Yesterday they topped off the beds with mushroom compost and filled all the cubbies. I am ready to plant! And here's my darling weeping Acer Crimson Queen in its own planter, covering a deep dead tree root system. I will be planting things around the perimeter in the planter. The planter is in view of the porch, and those beds below are going to be planted later today with golden euonymus. In the meantime I am having Nick and the guys make a firepit for wienie roasts and S'mores. We always have limbs and branches to supply kindling. After a year, the yard is really starting to look like a garden! So happy. Sigh. Here's my sister's lovely find from an estate sale. Hand embroidered and appliqued with cut work too! She got this gorgeous linen textile for only $12! It's been sitting at my house waiting for me to quilt it for months, and finally I acquiesced. Brooke ordered bamboo batting and some really nice 108" wide cotton backing fabric and I basted the top with pins and jumped right into the center. It was like riding a bike, altho I did have to unpick a few tentative stitches at first, but then it was smooth sailing. White is so forgiving. FYI, the handwork done by some Chinese person/s is so perfect and so sad at the same time. What a shame to undervalue this splendid artistry. I have a twin bed and put on the quilt to see how it fit. Plenty of drape, and lots of extra at the top for a pillow tuck, but it will never see my doggie's feet. I made sure of that. 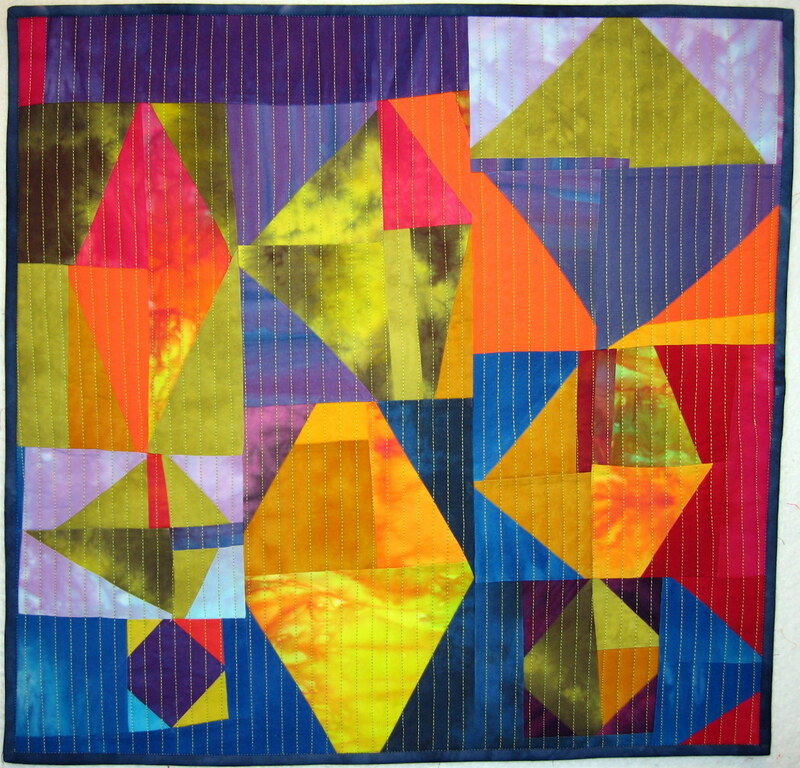 I took it to the church quilting room for final photography, because we have a huge wall and great lighting and the quilt was wider than the pin up wall. which is 96". Wow! So Brooke is trying to decide whether to follow through in selling it or keeping it. She wants $500 or best offer for it. If you are interested or care to make an offer, email me. It's early days, but I have been out in the garden looking for signs of life. This photo was taken last May 6th, and I can already tell what did and didn't work. At this point the weeds hadn't shown up in force and I was delirious to be finally getting these new beds planted. Now they are just showing what lived and what didn't. Must say I am disappointed to see no lupins, but I am determined to try again. The coneflowers are coming back in full force, and that thrills me. These are last year's pics. I promise to give the new 2019 plants more room to grow, and will mulch immediately to keep down the weeds. Nick my reluctant gardener has promised a load of mushroom compost and I will be topping off the beds which will nurture and prevent the terrible weeds I had in the flower beds last year. I will definitely do marigolds again, and of course lots of basil. The day lilies are looking good and in between, them, I see sprouts of peonies bursting through. I got more peony roots, bleeding hearts, and Asiatic lilies, plus daylily roots, and they got planted already. What didn't work was where I planted sun loving plants only to see them get spindly from being in the shade too long. This time I have transplanted my hosta to that space and am confident they will prosper. I also made an expensive mistake with my eleven hydrangea. I had Nick build a berm around the fence and I put them in there and while they did fine during the season, the massive rains we had washed away their soil, exposing the roots and killing many of them. The few that do have leaves will be transplanted to a safer spot. Darn. We live and learn. A stack of brand new solids, all Waverly, from Walmart. Why not? Good quality and nicely priced, and already cut for me. I stood there looking and thought, "Won't have to drag out all the colors I already own, and iron them, and cut them, and ..." before I realized it, I had a handful, well, two handfuls and was looking for more. 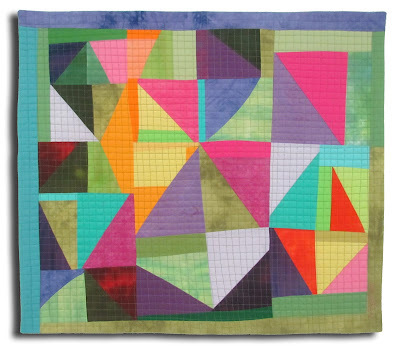 But before I get too involved, I have a big quilting project promised for my sister. It's a hand appliqued tablecloth, linen, with embroidery and cutwork, and she wants it quilted. Fancy stuff, of course. I am up for it. Stay tuned. There I was minding my own business, wasting time on Pinterest, when I saw a quilt top that led me to Ebay...and then saw this neglected, pack away, quilted Grandma's Flower Garden which had been found in one of those storage lockers, in Waco, Texas and was up for bidding. They had a price listed, like $39, and also would accept a best offer. Hmm. On a whim, I bid $28 and won. Amazing. I never win anything, mostly because I never bid or enter, or try anything. So today it arrived and I washed it, dried it and here it is on the floor of our sunroom. It is hand pieced and hand quilted. It's in pretty good shape, a few stains, and some faded fabrics, so I am guessing it is 20-30 years old, but I am only guessing. It went on my bed, and is too long in the corners and would invite our bad little doggie, Tony, to either lift his leg or chew on the corners. The good doggie, Chumley is sleeping on the floor in this shot. The hexagon edges are faced, with a polyester cotton liner, yellow gingham. All that hand work, O my! Below you might see the faded pieces, and a few stains, or not. Doesn't matter. It is safely out of the 'dungeon' and now it will live on the couch in the sunroom, making that place more homey.